At Ryan Aviation Seaplanes, we offer the unique opportunity of combining two ratings with only one checkride. Many of our student pilots already have their private ASEL rating, so we create a custom curriculum which allows them to obtain their Commercial and Seaplane ratings at the same time. The Husky is an Amphibious aircraft, allowing Land and Sea ratings to be combined into one training course and one checkride. 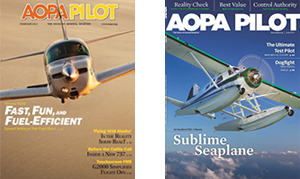 Also, as mentioned in our Commercial ASES page, a pilot student can train towards their seaplane rating while completing the 10 hour complex requirement for the commercial license. This results in the maximum benefit for your training dollar. Combined seaplane rating courses can range from two to seven days depending on the pilot's skill level and requirements they have previously met, and the cost will vary accordingly. Please call for more info and pricing.